Last week I shared that our dining room is in store for some updating and one of the projects on our to do list is some DIY map art. We have a large wall in the dining room and we’ve never found a piece of art that we love to fill it. And in the interest of giving this room a bit of style, we decided that map art could fill the space until we stumble upon an amazing piece of artwork. 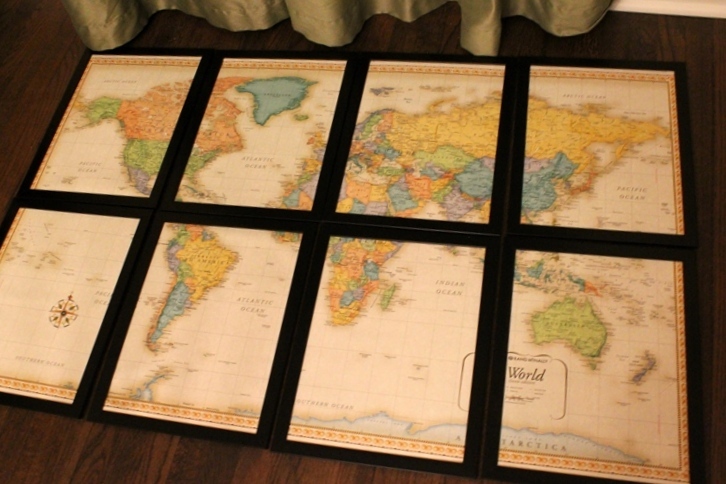 Awhile ago I pinned this canvas map art DIY from Christy Wright and actually picked up the same world map poster from Barnes & Noble because at just $8, what did I have to lose? So I hoarded it away for a future DIY date (the map is also available online here). But then I stumbled upon this map art on Tori’s Blog and fell.in.love. I love how the frames keep the map looking crisp and modern. And the multiple frames break up the art to give it more interest than if it were all in one frame. So I headed to JoAnn’s to figure out what size frames were available. I ended up with eight 12″x16″ frames for the 32″x50″ poster (it could get a little trim on the one side to make it fit!). I had originally planned to purchase six 16″x16″ frames but they didn’t have enough…in hindsight these might have worked better because they have fewer borders and less of the map would have been covered up by frame (sorry Wisconsin!). 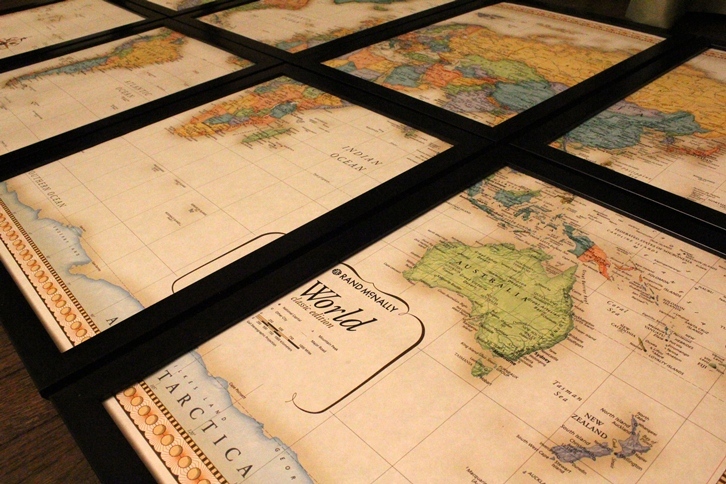 But, I still like the frames I ended up with :) And because we intend to use the maps as pinboards showing where we’ve traveled, I also picked up 3/32″ cork board rolls and spray adhesive. 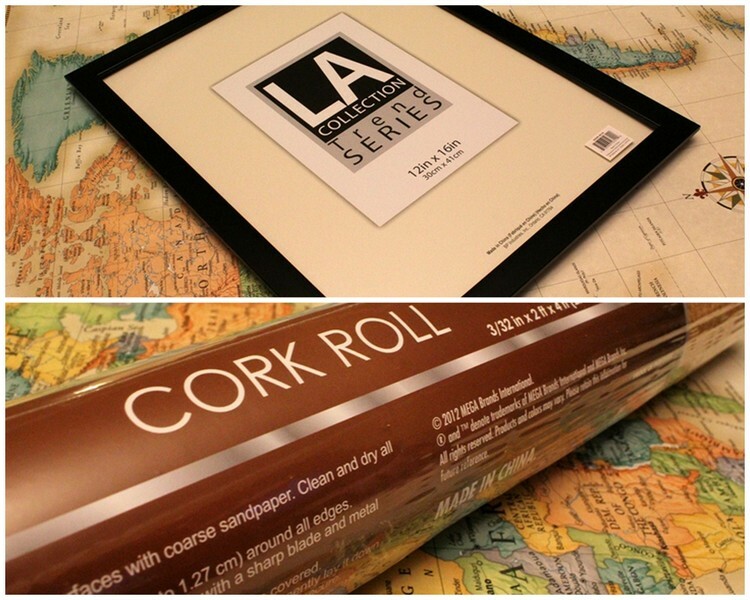 Once home, I rolled out the cork and realized that it should be flatted out to lay in the frames properly. So I cut the rolls into eight 12″x16″ rectangles and layered them between panes of the frame glass and put a large pile of books on top. And I started the task of cutting the map into eight pieces. I laid the frames out on top of the map to get an idea of where the seams would fall and realized that one would land directly on our home state of Michigan and completely hide it behind the frame! But since the map had to be trimmed width-wise by two inches anyhow, I cut all of the excess from one side so I could off-set the map and keep our home state. WHEW! *Obviously you wouldn’t be able to do this if your art fit your frames perfectly, so you might want to measure where your borders would land before choosing frame sizes! A few days later the cork was ready to go! After trying the cork and map in the frame on their own (without a glass front), I realized both would need to be glued down to keep them laying flat. So out came the glue gun! I glued the cork board directly onto the back of the frame. I have no pictures of this part because glue gunning by yourself does not leave an extra hand free for the camera! But all I did was glue a few inches at a time and smooth the cork out to eliminate as many glue bumps as possible. Glue, smooth, glue, smooth, glue, smooth…all the way down each frame back. 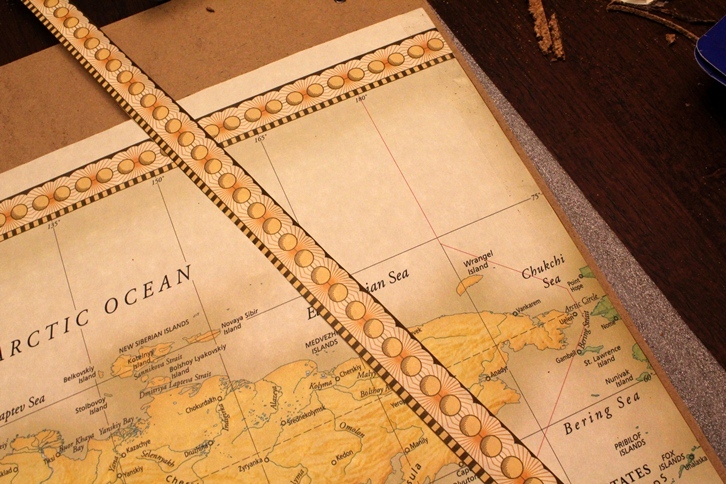 Then, I sprayed adhesive glue on the cork to attach the map pieces. Note: make sure you have the frame back right-side-up when you attach the map…not that I learned that the hard way once twice or anything. And remember when I sliced off one side of the map so Michigan would still be visible? 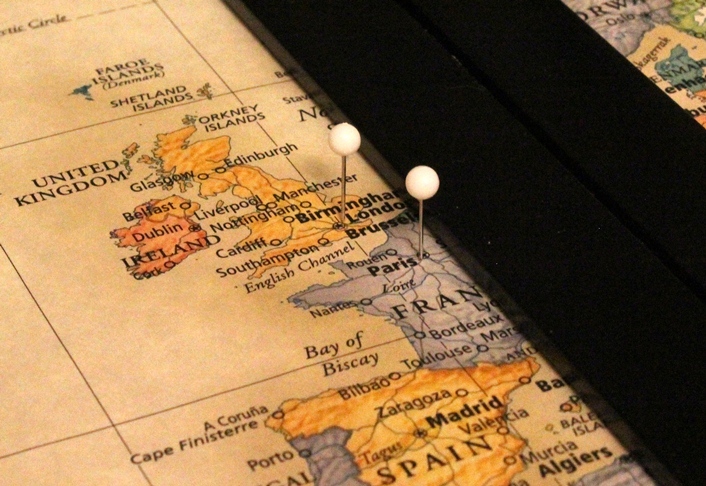 The map had a border so I trimmed and reattached it down the side with double sided tape so both ends would match. It’s not noticeable and since I don’t see us traveling to the Bering Sea anytime soon, I wasn’t too broken up about covering it up. Then just put the frames together! The glass does still fit inside the frame with the cork if we decide we don’t want to use pins. But for now we’re going for interactive art. Sorry for the anti-climatic photos on the floor! But I have two good excuses for not putting them on the wall quite yet – #1. Mr. Lemon is traveling and this frame hanging project seems a bit ambitious to tackle on my own and #2. We’re planning to paint the dining room in a week and a half so it seems best to wait! Did anyone else officially participate in the Pinterest Challenge? Or unofficially do something from Pinterest recently? Please share! Also, be sure to check out the Pinterest Challenge projects from Young House Love, Bower Power, The Remodeled Life, and Decor and the Dog! This entry was posted in Crafty, Home Decor and tagged crafty, home decor. Bookmark the permalink. Love it! Can’t wait to see it on the wall! Wow! I love the way it looks! And it’s such an amazing thing to get to put so many pins in! It’s fantastic! Thank you! I should have clarified that these are ALL of our pins – white for places we’ve been together, blue for places I’ve been on my own and green for places Mr. Lemon has been on his own. We can’t wait to start adding more of “our” pins! Love your take on this. Great job! I love this! I actually picked up a giant book of maps for $1 recently and need some ideas on what to do with it. Love this! Thank you! And major jealousy on your map book score! That looks awesome! I can’t believe a poster that large was only $8! I need to go check out Barnes & Noble because I really want something like this in our guest bedroom. I know! The poster is such a deal! 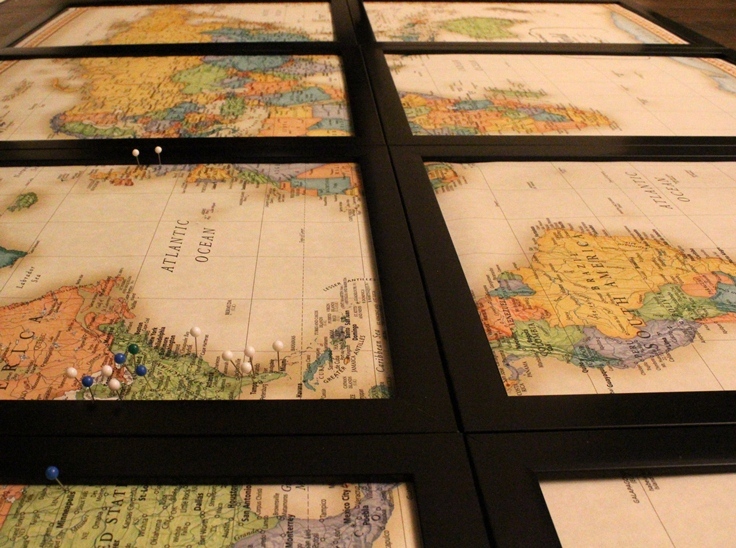 It was one of the least expensive parts of the entire project – even the map pins were $5! This is just what I needed! We have several maps in our youth room at church and I was thinking of how I can add more interest to them! Perfect! Thanks for sharing! Thank you! Good luck with your maps!